The crowd looks on as brand owner Dion Giolito speaks on the No. 3 cigar of 2014: the <b>Illusione Fume d'Amour Clementes</b>. 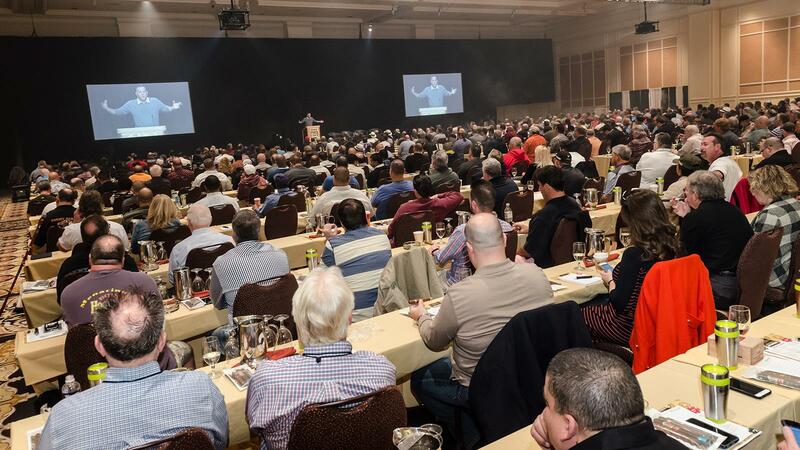 Braced at the entrance of the Mirage Hotel & Casino conference room, more than 500 cigar enthusiasts waited anxiously for the clock to strike 9:00—kick off time for Cigar Aficionado's sold-out, educational Big Smoke Las Vegas Saturday Seminars. These men and women were here to learn. And to smoke Cigar Aficionado's top three cigars of 2014, which were handed out in Boveda Humidor Bags when the magic hour arrived and the doors of the conference room swung open. The audience moved in and claimed their seats, lighting up cigars and shaking hands with old friends and new acquaintances, telling jokes and laughing it up between deep pulls of coffee and hearty puffs of smoke. As empty chairs disappeared and the noise level rose, David Savona, executive editor of Cigar Aficionado and co-moderator for the weekend program, took to the stage to welcome Big Smoke attendees and introduce the No. 3 cigar of 2014: the Illusione Fume d'Amour Clementes, a 6 1/2" by 48 ring corona gorda made at the TABSA factory (Tabacos Valle de Jalapa S.A.) in Nicaragua. Brand owner Dion Giolito was then invited to the podium to tell his story as a cigar retailer, to reveal his insights as a cigarmaker; and to smoke the Fume d'Amour Clementes along with the audience. "I've been in the retail business for 25 years." Giolito explained to the room. "I started out working in a cigar shop. I have fond memories of those guys at the cigar shop. I learned to enjoy all different types of cigars." Giolito noted that it was in his early years working at retail that he first developed a love for Nicaraguan tobacco (the Fume d'Amour is a Nicaraguan puro). And he was able to learn many lessons about the cigar industry that would help him succeed later in life as a cigarmaker. "The U.S. market is without a doubt, the hardest, most difficult market to make an impression on. Because there's so much competition, and so many great cigars...I've seen brands that grow too big, too quick. I don't release that many brands. This is almost my 10th year in business on the manufacturing end." Giolito concluded his speech with some advice on blending a cigar. "When I build a cigar, there are many components that I look for. The aroma, the flavor, the palate stimulation...When I released [Fume d'Amour] I knew it was special. And I'm very happy Cigar Aficionado appreciated it as well....It's a fantastic cigar, and I hope you think it is too." Giolito left the stage, and co-moderators David Savona and Gordon Mott segued into a half-hour panel discussion on Cuba, with special emphasis on Cuban cigars. Afterwards, Savona returned to the podium and encouraged the audience to light up the No. 2 Cigar of 2014, the E.P. Carrillo La Historia E-III, measuring 6 7/8" by 54 and made by EPC Cigar Co. at Tabacalera de Alianza S.A. in the Dominican Republic. Unfortunately, Ernesto Perez-Carrillo, the cigarmaker behind the blend, was unable to attend this year's Big Smoke Las Vegas, and in his absence sent a warmhearted video addressed to the audience. "I want to thank you for being at the Big Smoke seminar this morning, and apologize for not being able to be with you celebrating and enjoying Cigar Aficionado's top three cigars of 2014," Perez-Carrillo said. The famed cigarmaker went on to thank those who made La Historia possible, including his family, friends and fellow cigar industry members, and revealed some of the history behind the brand. "La Historia was introduced in 2014 and became an instant success," Perez-Carrillo said. "But when Cigar Aficionado nominated it the number two cigar of 2014, it reminded me of what happened when Cigar Aficionado gave La Gloria Cubana Wavell a 90 [point rating] in its first issue. Only this time we were a bit more prepared to handle the demand." Perez-Carrillo then delved into the backstory of the No. 2 cigar of the year, and the process in which it was developed. "La Historia came about one day in 2012, when my son Ernie came to me with the idea of making a cigar that would tell the story of the Perez-Carrillo family. It was a task I did not take lightly." In the video, Perez-Carrillo recounted how his daughter Lissette was instrumental in developing the band and packaging of the cigar, but for more than a year, he delayed announcing the new brand, stating, "Nothing I blended seemed good enough for this cigar." Then one day, after a stroke of improvisation, the key to the cigar's potential was unlocked. "Finally in March 2014, I thought I had achieved the goal. About a month into production, one day I was smoking the E-III and I felt there was something in the blend that was not right. So the following day, I decided to put half a leaf of the seco tobacco instead of the whole leaf we were using in the blend, and when I smoked the sample I knew the Perez-Carrillo story would be written in a way that could not be told with words." The third and final cigar break of Big Smoke Las Vegas 2015 was reserved for the No. 1 cigar of 2014, the Oliva Serie V Melanio Figurado, made by Oliva Cigar Co. at Tabacalera Oliva de Estelí S.A., in Nicaragua. Jose Oliva, president of the company took to the stage to discuss the champion cigar and light up the 6 1/2" by 52 box-pressed figurado with the audience. "It is really an honor to have won cigar of the year," Oliva said. "Right now in the history of cigars, we are smoking the finest cigars." Oliva went on to suggest that we are living in a 'golden age' of premium cigars, similar to the peak that automotive enthusiasts enjoyed in the 1960's. "It's like the ‘60s and muscle cars," he said. Oliva then spoke about his family's success with the Serie V line of cigars, and the award-winning followup project, Serie V Melanio, which wears a Sumatra seed wrapper, grown in Ecuador. "In 2007, when we introduced the Serie V...the great challenge was maintaining that quality, to stare back-orders in the face but stick to that commitment." Oliva said the next hurdle was to follow up the Serie V with an even more successful cigar. He said the solution was not only a new blend, but to limit the production numbers of the cigar as well. "The finest of cigars are made in the most limited of quantities." "My commitment, and my family's commitment is that we won't put out any cigars that don't taste the same way they did when they were first introduced." Oliva thanked the audience for their time and support and brought the third cigar break to a close, leaving the stage in a cloud of smoke to the sound of thunderous applause.